I am elated to announce that I will be releasing The Water’s Edge (recorded at the Signature Sounds Studio by Mark Thayer and produced by Dave Golden) on November 30th, 2011, at the legendary Club Passim! Club Passim not only offers some of the finest folk music in the country all year round, but they have a fantastic menu and now offer local brews! As if that’s not exciting enough, I am both delighted and humbled to present two of Boston’s best singer/songwriters, Beth Colegrove and Dan Blakeslee, who will each play a short set to open the evening. Wowza! This is the biggest show I’ll put on this year – in fact, it’s the biggest show I’ve put on in years. Those of you who pre-ordered this CD waaaay back when, have a concept of how long I’ve been waiting to share this with you all. This is not a show to miss. So, tell your friends, tell your family, tell strangers on the street! Just get the word OUT THERE!! If you’re concerned about seating, don’t hesitate to book your table and order your tickets online. This is going to be BIG. Thank you so much to all of you who have supported me along this long and crazy journey of making an album. Now let’s do it justice and fill those seats at Boston’s premiere folk club! 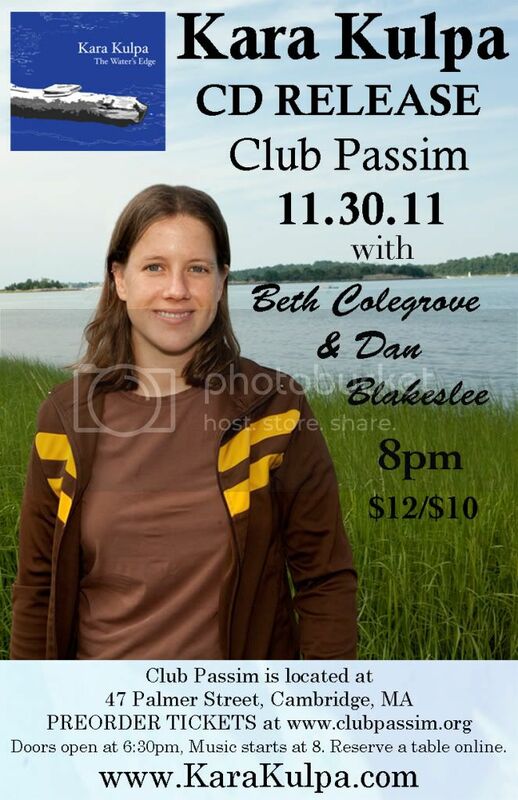 See you THERE – November 30th, at Club Passim!